A huge variety of fresh fruits and vegetables are available throughout the year in Thailand due to the ideal climate and soil conditions perfect for cultivation. There are indeed and, unmistakably many kinds of unfamiliar, brilliantly coloured as well as some bizarre-shaped exotic fruits for the adventurous traveller. 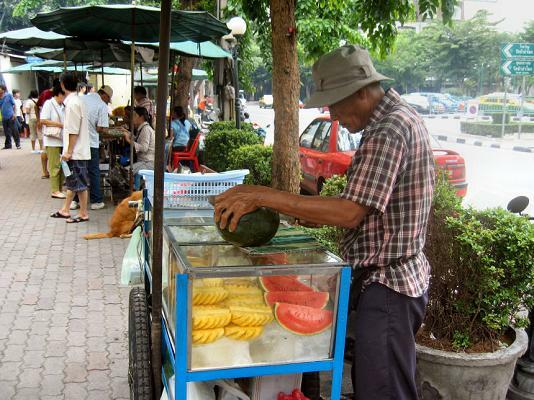 Wherever you wander around the often crowded streets of Thailand, you will most surely come across fruit sellers with their glass-fronted carts with peeled pieces of fresh seasonal fruit stacked around blocks of ice. Most of the fruit the vendors sell are familiar to the average tourist with watermelon and pineapple being the chief choices. Not only are these fruits nutritious, they make excellent snacks while providing you with some cool comfort from the heat on the street. Simply stop and choose a selection of your favourite fruits and the seller will pop them in a cellophane bag along with a toothpick. 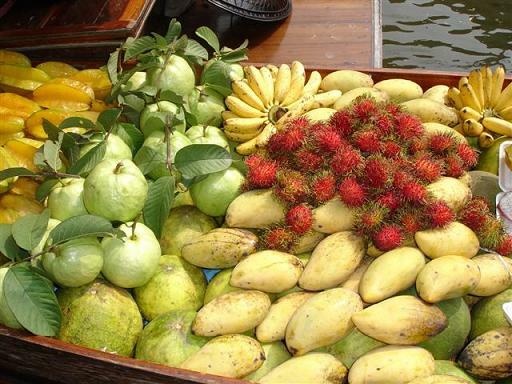 Better known tropical fruits grown in Thailand are unmistakable to many of us. They include Papaya, Watermelon, Mango and Pineapple. There are some lesser known varieties too. Orchids and fruit farms around the country produce a host of exotic fruits that are unfamiliar to many new visitors. Included are the much-prized Durian, the melt-in-the-mouth Mangosteen, the grapefruit-like Pomelo, the tangy Jack Fruit, the hairy Rambutan and the bizarre looking Dragon Fruit. 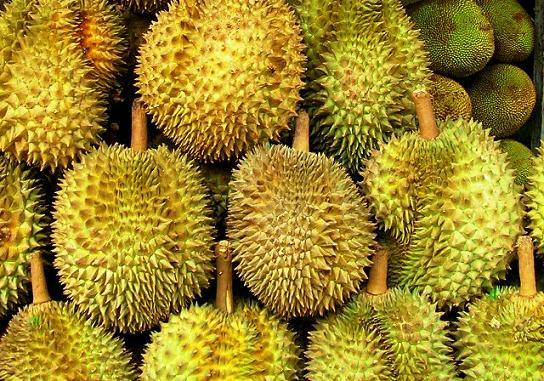 Durian is a controversial exotic fruit that you'll either love or hate. Ask any tourist in Thailand to recall the first time they came across it and they will tell you the same story. It stinks! Well, perhaps the word "stink" could be termed a little harsh, but nevertheless, the odour can be rather repugnant and repulsive to most westerners but for Thai's, it commands the utmost respect. 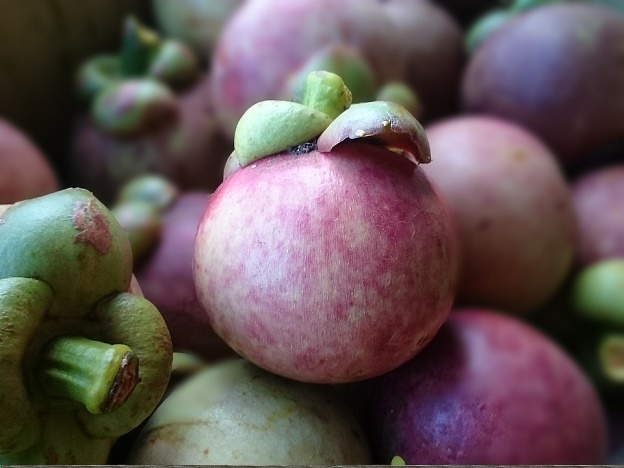 Mangosteen is the king of Thai fruits and the locals believe the cool and refreshing sweet taste of this fruit is a kind of chaser to the Durian. See if you can guess the number of sections your mangosteen has before you break it open? 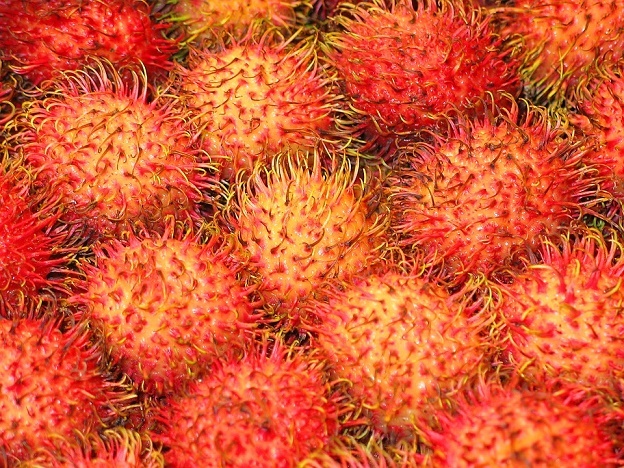 Rambutan is a close cousin of the Lychee and Longan family and has similar tastes and textures. The flesh is sweet with the only difference being the fruits reddish-brown skins which are covered with fine green-tipped hairs. 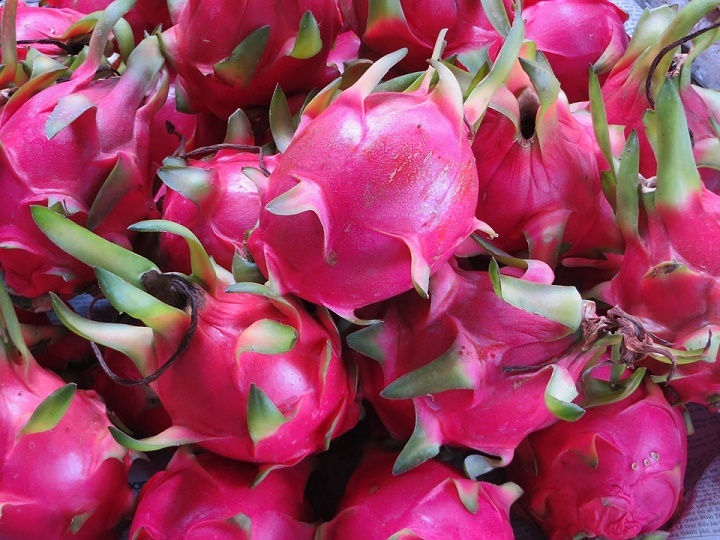 Dragon Fruit is a rather bizarre, but beautiful and brightly coloured cactus type fruit widely cultivated in Thailand and other parts of Southeast Asia as well as Central and South America. There are pink ones that have sweet and crunchy white flesh smothered in black seeds and covered with pointy green-tipped scales and yellow ones that are smaller in size and look more like prickly pears. This fruit is best eaten chilled with perhaps a sprinkling of lemon juice. 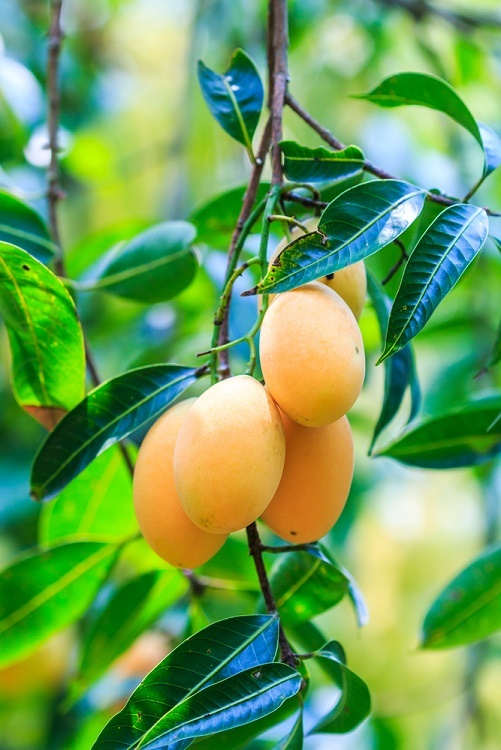 Mango is one of the world's favourite tropical fruits of which there are many different kinds. Most are oval in shape with green, gold and red skins and succulent yellow flesh which can be quite fibrous although the modern varieties are more often smooth and velvety. Mangoes widely cultivated throughout Thailand are predominately green in colour and are a little less plump with a slight curvature. 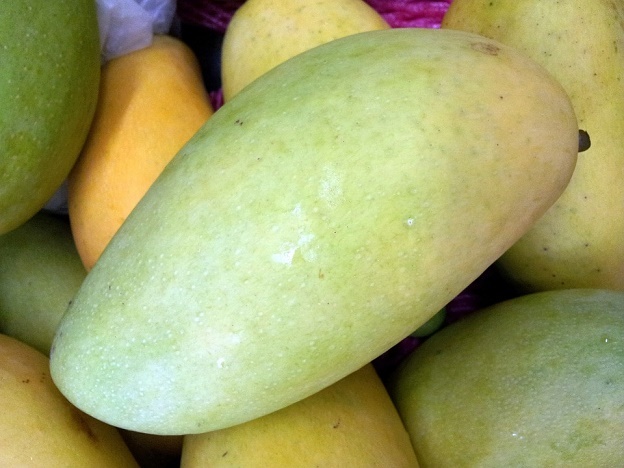 The yellow flesh of Thai mangoes is nice and sweet and surprisingly delicious.